Based in Horgen / Zürich – directly at the Lake Zurich – 30 minutes from Airport Zurich and 15 minuten from Zurich City. 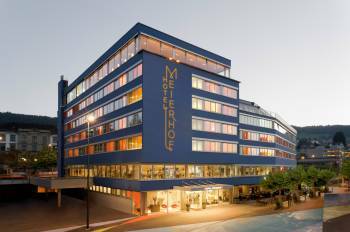 The Hotel Meierhof offers 108 non-smoking rooms and 3 conference rooms for up to 90 peoples. The motto All-in au lac means that everything is already included into the offered price – breakfast, WiFi, Parking spacex ( on availability ) , Coffee and Tea to go, Activ Fitness Center, Waterbar on each floor. The conference packages include already room rental, 2 coffee breaks, 1 lunch, WiFi and parking spaces.The Lounge & Bar au lac – 35m over the Lake Zurich – offers an breath taking view over the Lake Zurich. Relxing during the breakfast or having an apero or dinner in the evening. You will have the possibility to rent the Lounge & Bar au lac exclusive for your business or private event. The Hotel Meierhof offers 3 conference rooms for 5 up to 90 people. All rooms have daylight, air conditioning, modern equipment such as projector and screen, flip chart, pin board, presentation item case, writing material etc. In addition, W-LAN and parking spaces (subject to availability) are available to all delegates free of charge, in line with our slogan: All-in au lac.